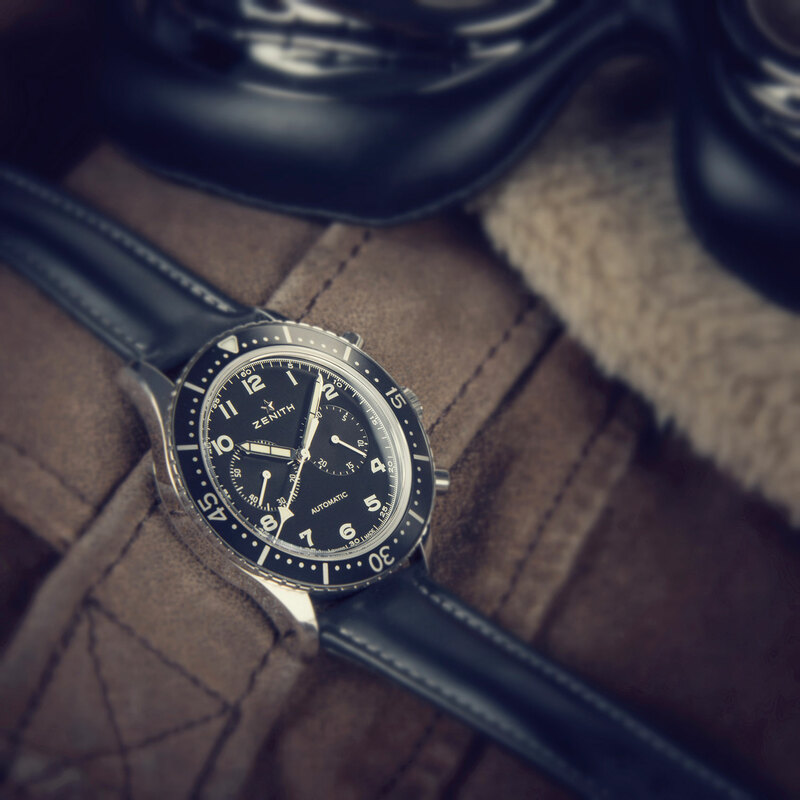 There are a few select words and phrases regarding vintage watches that, when said, are sure to light the fires of enthusiasm inside a collector. One such phrase is “military provenance”; another, which can stoke either the flames of desire or disgust, depending on who you’re speaking to, is “vintage reissue”. We’re going to invoke both phrases here. In the 1960s, Zenith produced a watch with some serious military cred, which they recently celebrated with a faithful modern re-creation, limited to 1000 pieces. 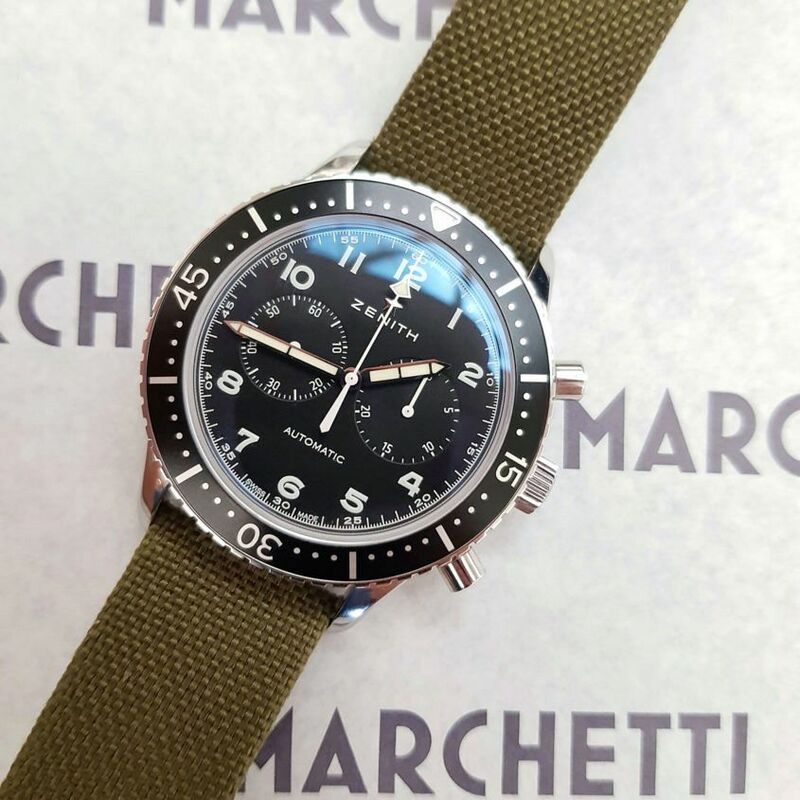 The original, code-named the Tipo CP-2 chronograph, was made for pilots of the Italian armed forces. It was also known as the “A. Cairelli”, after its Rome-based distributor, whose name is printed on the dial. Prices of these cockpit-appointed chronographs have gone sky-high in the last couple of years – one selling for CHF62,500 last year at Phillip’s Start-Stop-Reset auction in Geneva. 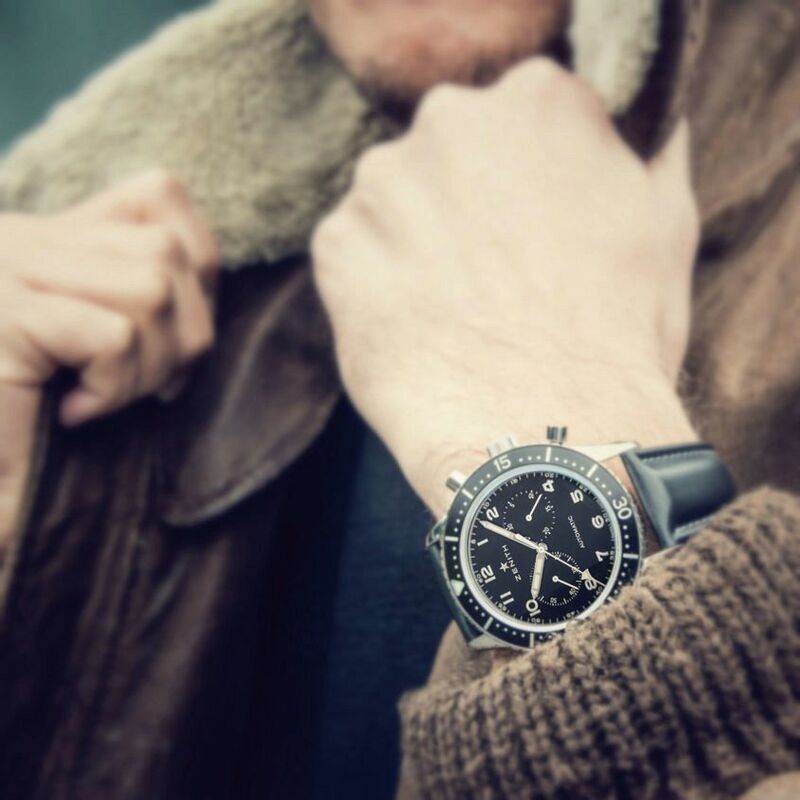 It’s not inaccurate, then, to say that the demand for a handsome military-inspired chronograph is peaking, and the release of the new Zenith Cronometro Tipo CP-2 was perfectly pitched to delight both vintage and modern-day collectors. The appeal of the Tipo CP-2 is largely down to the fact that it’s an absolute dead ringer for the original. At 43mm, the stainless-steel case is identical to the original and wears slightly smaller than you would think, thanks to its slender shape and bevelled lugs, all fully polished. I like to imagine that on the original, this mirror-like treatment was an ingenious design feature that allowed pilots to use reflections to signal a search party if they went down behind enemy lines. Regardless of how (un)likely my fanicful theory is, on the modern-day version the polish serves to add some style to an otherwise utilitarian design. Practical design was essential for the original, and it’s been perfectly recaptured for the contemporary reissue. Purists can rejoice at the decision not to add a date window to the matte-black dial, and it’s bicompax layout with large white Arabic numerals is well proportioned and easy to read. The segmented hour and minutes hands, which were typical of ’60s tool watches, remain true to the original and are a feature that I personally find really appealing. 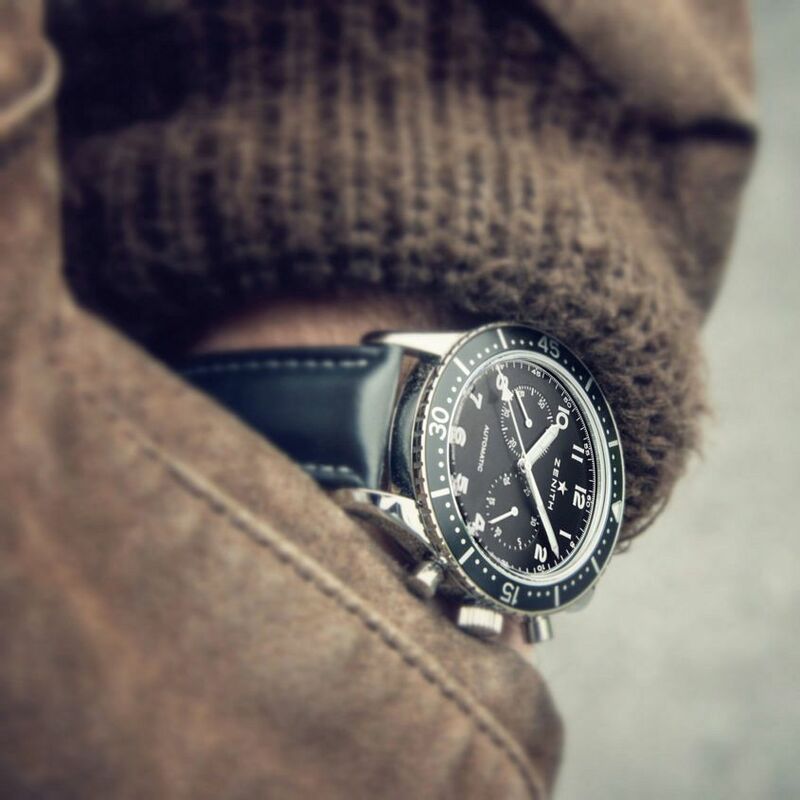 The bezel is bidirectional and has a fully graduated 60-minute scale that, when combined with the chronograph, can be used to time two events at the same time. Remember, first and foremost, this was, and still is, an all-functioning tool watch. Behind the solid caseback beats the legendary automatic El Primero 4069 chronograph movement, with a 50-hour power reserve and a frequency of 36,000 v/ph. Which means a buttery-smooth sweeping seconds hand capable of measuring 1/10th of a second intervals and a pair of pump pushers that are simply a joy to use. While honouring their heritage, Zenith has listened to the collectors and shown that a tool watch can be functional as well as stylish.